The holidays are here! How did that happen? I’m starting to make my list of gifts to buy for loved ones, so I thought I’d round up a few of my favorite things that you might like to give to your family and friends. I’m just as particular about the items in my home as I am my recipes, which is to say very particular. Here are some of my tried-and-true favorites, from clothing and accessories that are worth every penny, to natural skin-care products that work, to my favorite non-fiction read of the year and the ten-dollar gold earrings I can’t stop wearing. 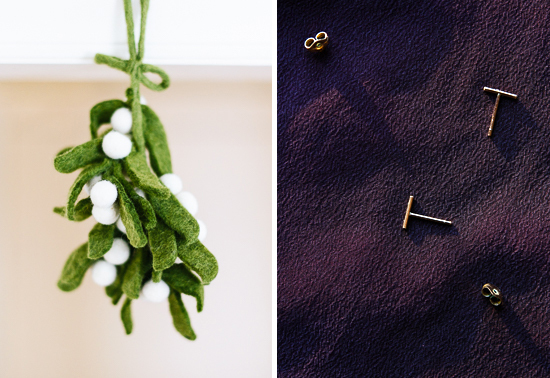 You might find a few new favorites to add to your own wish list, too! 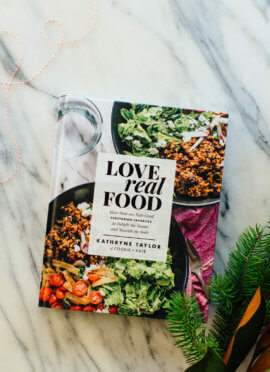 For even more ideas, check out my kitchen essentials, as well as my favorite cookbooks and last year’s holiday gift guide. Some of the links below are affiliate links, which means I’ll get a small commission if you purchase through my links (at no cost to you, of course). Thank you for supporting Cookie and Kate! Tad Carpenter Field Print: If you’re curious about the blue print behind my little tree, you can get a better look at it here. It’s made by a local Kansas City illustrator and available for purchase online, along with lots of other fun prints. Update! I just found his prints (framed) at West Elm, too. 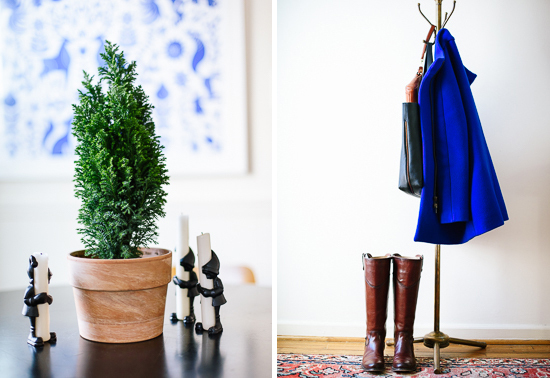 J.Crew Stadium Cloth Cocoon Coat: This warm, classic coat is one of my favorite purchases of all time. I call it my Princess Kate coat. The eye-catching color brightens up cold winter days and I get compliments on it everywhere I go. I bought this coat a couple of seasons ago, so it’s no longer available in royal blue, but it comes in a ton of other bright colors this year. Everlane Casual Petra Bag: Everlane makes the most amazing clothing and accessories for men and women, with total transparency on where the items are made and how much they cost to make them. I treat their leather tote bag like my briefcase. My 15″ MacBook fits perfectly inside, even in its neoprene case. The quality of this bag is far superior to the similar totes at J.Crew and Madewell. I don’t think I’ll ever need another one! Frye Melissa Tab Knee-High Boot in redwood vintage leather: This year, I splurged on the most gorgeous pair of brown riding boots. I’m still wearing my first pair of riding boots, ten years later, and I intend to wear these for at least as long. They’re also available in black and in wide-calf sizes as well. If you can’t find your size, check Zappos. Radha Organic Rosehip Oil: I’m cleaning up my skincare act and this natural oil is working wonders. Rosehip oil came recommended by Monique, who has the most amazing skin, so I thought I’d give it a shot. It’s very moisturizing and, I swear, it seems to be fading some faint age spots on my cheeks. I just apply a few drops at night since it has a light orange tint to it. If you’re worried about breakouts, I haven’t had any from this oil. Did I mention it’s only $12? Osmia Spa Series Rosemary Body Mousse: Super luxurious, rosemary-scented body mousse that really moisturizes. I love the smell of this stuff and it doesn’t irritate my sensitive skin. 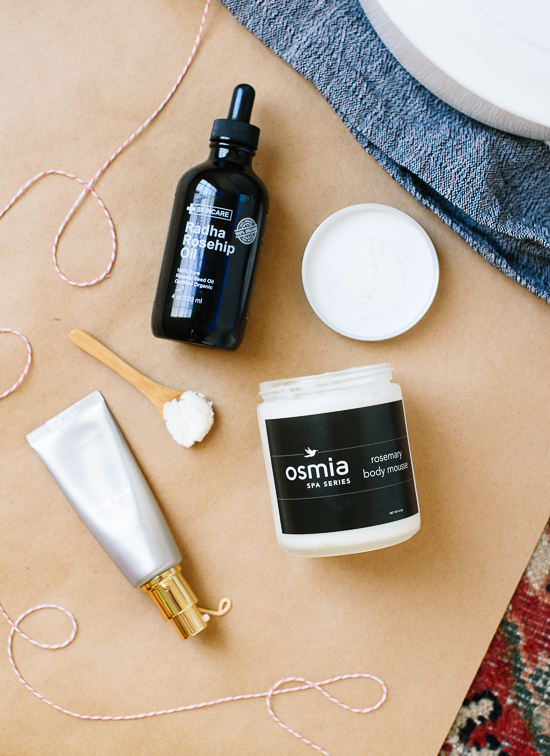 Osmia makes a lot of wonderful natural skincare products and their founder, Sarah, is a really passionate, funny lady and former E.R. doctor. Beautycounter Dew Skin Tinted Moisturizer: Beautycounter is a new cosmetics and skincare company that uses strictly non-toxic ingredients. I traded in my Nars tinted moisturizer for their version and I like it even better. It’s light and provides a nice amount of natural-looking coverage. The built-in sunscreen has saved me from several sunburns already. Le Creuset 5.5-Quart Dutch Oven in white: Will I ever be quiet about my Le Creuset Dutch ovens? Nope. This heirloom-quality pot makes everything taste better and looks great on the table. The 5.5 quart size is perfect for making 4 to 8 servings of soup, pasta, rice and so forth. Amazon is offering a nice price on the white one right now, but it’s available in even more colors at Williams-Sonoma. FashionABLE Legesse Tea Towels: My friend Kelly helped design these woven cotton tea towels, which benefit the Ethiopian women who made them. These absorbent towels wash beautifully, come in lots of great colors and patterns and are reasonably priced at $16 each. Vitamix Blender: Here’s another item I can’t stop talking about. Vitamix is offering refurbished blenders with soup and smoothie functions for $329 right now. They come with my favorite blender container (the tall one), too. I have a refurbished Vitamix and it has never failed me. If you want the Rolls Royce of blenders, I can also vouch for this beaut. Give the gift of ultra-creamy soup this year! Earlywood Ladle: Another soup-related gift, a handmade wooden ladle. Treat this beauty well and it will live forever. Ikea Sittning Salad Server Set: I’m really digging these retro salad servers from Ikea! Available in stores only. 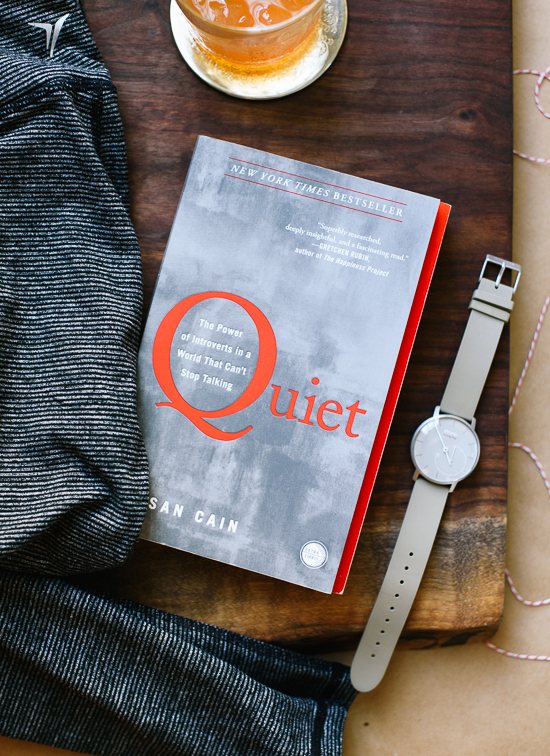 Quiet: The Power of Introverts in a World That Can’t Stop Talking: I identified with so much of this book. It helped me better appreciate my own quirks and the diversity of personality traits around me. Steal away from the holiday hubbub with this one, and know that you’re not the only one who needs plenty of peace and quiet. Withings Activité Pop Smart Watch: This watch is a really cute fitness tracker. It counts your steps and tracks your sleep automatically. I’ve gotten a number of compliments on its looks and people freak out when I tell them it works like a FitBit, too. Old Navy Striped Compression Leggings: Meet my all-time favorite yoga leggings. These are so soft and comfortable. They’re stretchy but never lose their shape, and they’re thick enough that they’re not see-through in the slightest. I also love Old Navy’s black leggings, but there’s something about the fabric of this striped version that makes them even better. If you’re in between sizes, I find that their leggings run snug. West Elm Bodega Glassware: Really nice looking and cheap glassware. These glasses look delicate but they’re plenty durable. 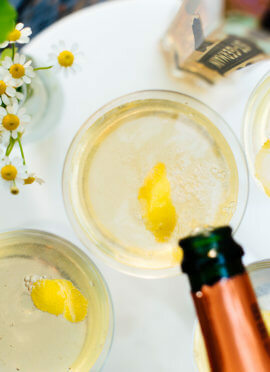 If you need extra glassware for guests this year, these are perfect—only $36 for a set of twelve. You can purchase them individually in stores. Vermont Farm Table Live-Edge Walnut Board: That beautiful background is a live-edge walnut board from Vermont Farm Table. Vermont Farm Table is a family-owned business that makes gorgeous wooden kitchen tools, as well as my dream dining table. 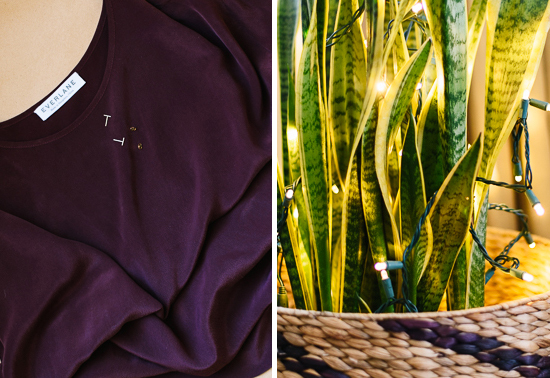 Everlane Silk Short-Sleeve Crew: Meet my latest Everlane obsession, this super elegant silk tee ($75). You can dress it up with a long necklace or fold up the sleeves for a more casual look. The sleeves are a little longer than your average women’s cut tee, which means they are actually flattering. Everlane now offers a ton of different styles of silk tops, as well as exceptionally soft cashmere sweaters. Their menswear is really sharp, too. 8mm Gold Bar Earrings: These super simple, dainty 14-karat gold-filled earrings are handmade in Brooklyn and cost only $10. I put them in and forget that I’m wearing them for days! If you need even more ideas, don’t forget about my kitchen essentials shop, favorite cookbooks list and last year’s holiday gift guide! Thanks, Laura! That’s a great idea. I’m kind of obsessed. Happy holidays! Love all these picks!! Totally agree that Frye boots will last forever! (I’ve had mines for ~3 years and they still look new!) Also love Susan Cain’s Quiet–I really related to it too. I want to read Brene Brown’s Rising Strong next! 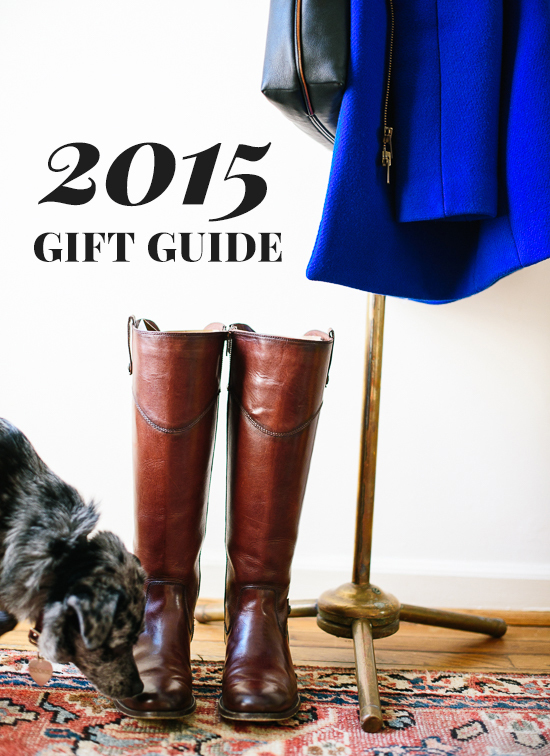 Have to check out those JCrew coats–so classy and chic! Thanks, Emily! I haven’t read Rising Strong yet, either, but I love Brene Brown! 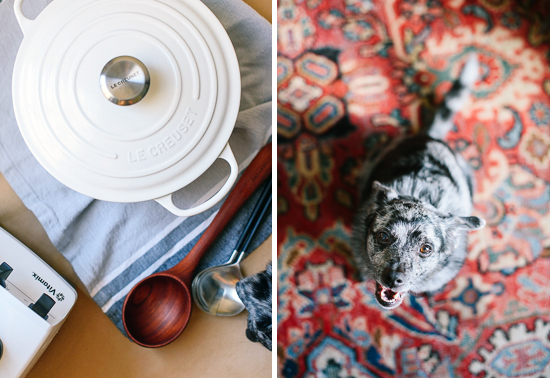 That Dutch oven is on my wishlist! This is a great list! A post or two ago you mentioned the vitamix sale (and free shipping!!!) and I bought myself one. I’m so excited to use it! My husband and I have recently gone vegan (after being vegetarian for many years) and I’m on the verge of killing the “normal” blender I’ve had since the start of college. Which, eek, I’m realizing was seven years ago. Hey Krystal! Ohhh, I’m excited about your new Vitamix. That’s such a great deal. Yay!!! Rosehip is such an amazing oil. I’m so happy you like it! Happy holidays, Kathryn! xo. Ohh, so much good stuff! I especially love the “Princess Kate Coat” :) Question about the compression leggings: do you find them too tight? I’ve been looking for a pair of compression leggings, but in some of them, I find they are hard to move around in. Thoughts? Thanks, Elissa! My normal size in those leggings is too “compressed” for my liking, so I size up. They’re perfect for lounging and for yoga that way. Kate, I love your blog, and initially came across it because I am a an animal loving vegetarian. I have to say I am suprised and disappointed to see the celebration of leather. In my paradigm, it’s no different than Cookie’s skin. I know we all have areas of personal conflict and compromise when it comes to our relationship with animals, and it is impossible to be human and live entirely without causing harm to other beings. This is why I emphasize my objection as “the celebration of.” I do feel we can, and should, strive to at least minimize our personal exploitation of animals whenever possible and also to model this ideal by example. We can’t completely avoid the products of animal suffering, but we can be vigilant in considering how we can reduce our personal impact. Hi Mary, thank you for your feedback. I hear you. In the past year or so, I have started paying more attention to where my clothing comes from and I think this post reflects that. I would really like to see companies be more transparent about their sourcing and labor practices, whether they’re making leather or not. I have been operating under the assumption that most leather comes from animals who were raised for meat so I’m not contributing to their demise by wearing it, but I’ve very recently realized that is not always the case. For what it’s worth, I do buy quality items and take care of them so they last a long time, and I’ll be giving more thought to future purchases than I have in the past. Love this list! I’m going to have to check out those Old Navy leggings. I bought a new pair from Gap recently and I’ve been very disappointed with them since they are a little see-through. But I’ll give Old Navy ones a go – the stripe pattern is fantastic! Also, I admire your commitment to sustainability and supporting companies that promote transparency in their supply chain. I work on human trafficking research and appreciate your advocacy! Thanks, Alexa! I am paying a lot more attention to where my clothes come from lately. I hope you like the Old Navy leggings. I size up so they’re not super duper tight, which probably helps prevent the see-through issue as well. Such a great list, Kate! I splurged on those same Frye boots and have absolutely no regrets. Just love them and wear them all of the time! Been wanting to read Quiet as well- heard so many good things about that one! Thank you, Emily! Yay for matching boots!